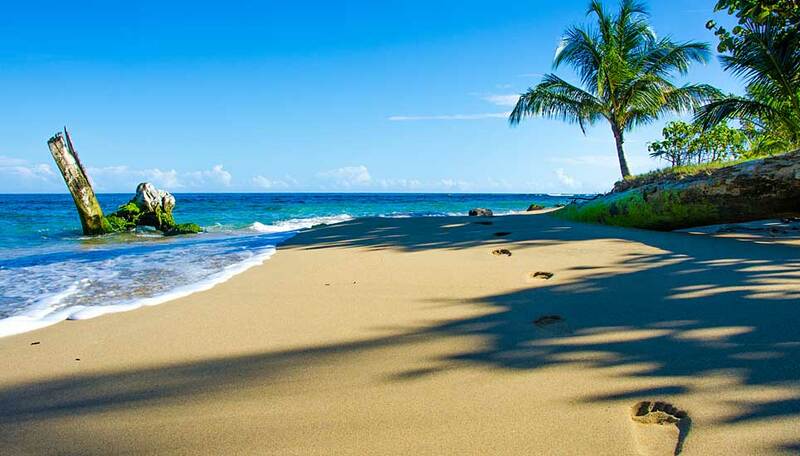 This Costa Rican holiday will give you a perfect balance between relaxation and activity. Not only that, you will get to experience both the Caribbean Coast with its laid back Afro-Caribbean culture and the Pacific Coast with the beautiful beaches and sunsets that this coastal paradise has to offer. 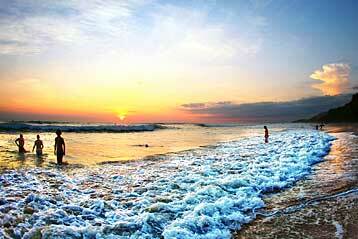 Sandwiched in the middle you have time to discover inland Costa Rica. 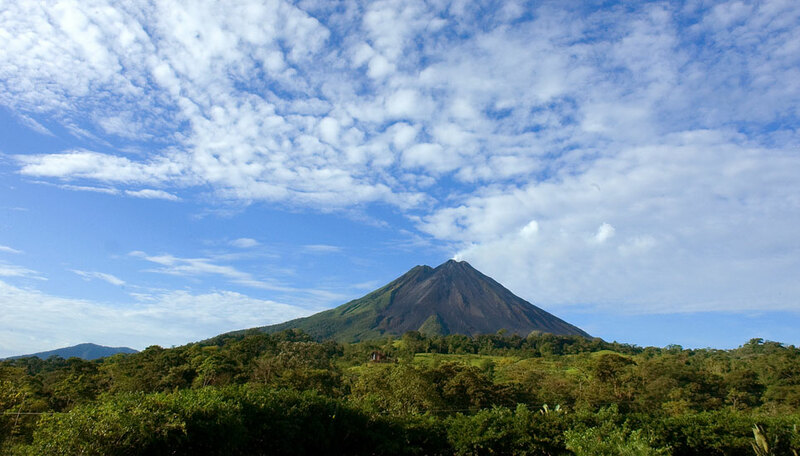 With stays in two different national parks, Arenal and Rincón de la Vieja – this holiday will certainly give you a great insight into Costa Rica, its coasts and volcanoes. Leaving San José, you will start your holiday by the beach, but unlike some destinations, the beach here on the Caribbean is backed by jungle teeming with wildlife for you to explore. There is time to explore the nearby coral reef too, it plays host to a bounty of marine life making snorkelling a very pleasant way to spend some time. Heading inland you have time to explore on foot or get your adrenaline pumping with more adventurous activities such as ziplining in the forest canopy, horse riding then soothe your aching muscles in the hot springs and bubbling mud baths. As you travel across the country you will traverse some amazing scenery, from plantations to lakes to awe-inspiring volcanoes and the surrounding national parks. Finish up where you started, on the beach, but this time on the Pacific coast, which is very different to the Caribbean, and end your holiday unwinding even further before spending your last night where it all began, with views over the Central Valley and San José. Each destination will give you a different taste of Costa Rica. You can enjoy your surroundings together with all the creature comforts you might expect, along with Costa Rican cuisine and of course, excellent hospitality – you’ll want to come back for more! If you prefer the additional freedom of a self-drive holiday we can arrange for car hire from day 2 to day 15. You will be given comprehensive driving notes and sat nav to help you navigate the route, and can choose to set off and break journeys en-route as you please. 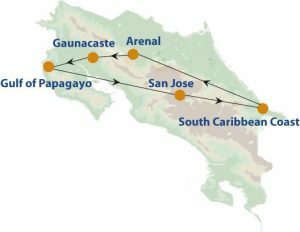 This standard itinerary can be upgraded by staying at Shawandha Lodge (or Le Cameleon for a further supplement) on the Caribbean coast and Rio Perdido in place of Hacienda Guachipelin in northern Costa Rica. This upgrade option spends an extra night on the Caribbean coast and one less night less at Arenal. USING SHARED TRANSFER OPTION: January-April and July-August £1,600. May-June and September-October £1,560. November-10 December £1,540. SELF-DRIVE OPTION: January-April £1,935. May-June £1,845. July-August £1,880. September-October £1,845. November-10 December £1,820. UPGRADED OPTION: (Using Shawandha on the Caribbean instead of Cariblue, and Rio Perdido instead of Hacienda Gauchipelin. Uses private transfers. Other upgrades are possible – please ask). January-April £1,795. May-June £1,675. July-August £1,765. September-October £1,675. November-10 December £1,675. Note: Dates including festive periods such as Easter attract a supplement on the above prices. Includes: Transfers, ground transport, 14 nights twin share accommodation, meals as specified The self-drive option includes hire of a manual SUV compact vehicle from days 2 to day 15 with car insurance, satnav and free mileage Tours: Full day guided tour in Cahuita National Park inc. transport, entrance fee, snorkelling and lunch. 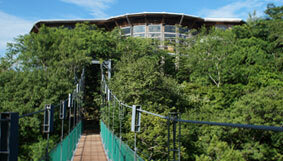 Half day tour of hanging bridges in Arenal National Park inc. transport, bilingual guide, entrance fee. Half day horse riding tour to Oropendola waterfall inc. transport, local guide, entrance fee. The upgrade option also includes a canyon adventure tour at Rio Perdido. Excludes: International flights, departure taxes, visas, travel insurance, meals not specified, drinks, optional excursions and activities at Caribbean coast, Arenal and the Gulf of Papagayo, personal expenses, tips. Getting there: This tour starts and ends in San Jose. 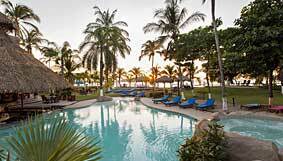 Return flight prices from the UK start from around £600. Departure dates: This is a private, tailor-made holiday and can begin on any day you chose, subject to availability. Located on Central Avenue in the heart of downtown San Jose, this hotel is a convenient base in the city, within easy reach of shops, bars and restaurants, and bicycles are provided of you want to explore further afield. Accommodation is comfy and includes spacious superior rooms and suites. Hotel facilities include a gym, free Wi-Fi and a roof terrace with great views over the city. A complimentary buffet breakfast is provided each morning to set you up well for the day ahead. 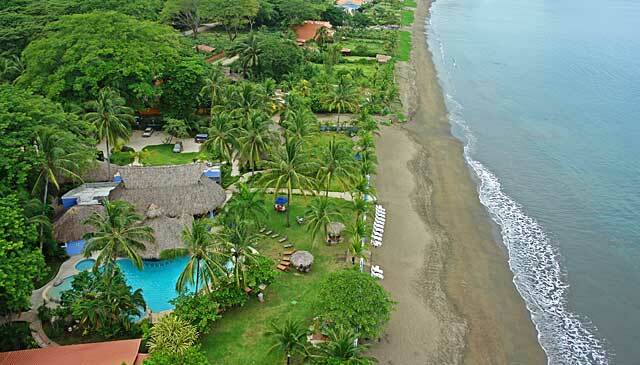 At Cariblue you can rest by Playa Cocles beach as you enjoy the relaxing pace of life in southern Caribbean Costa Rica. The property also includes 2 hectares of rainforest which you can explore at your leisure. There are several types of room, some in the gardens and others by the beach. All are air conditioned, have a ceiling fan, phone, free Wi-Fi, safe, hairdryer and private bathroom. Some also have a balcony, and there are larger family units. The large thatched main lodge houses the reception, bar and restaurant, and is the social heart of the hotel. 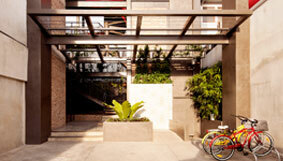 Recreational facilities include 2 swimming pools, 2 jacuzzis and a spa. 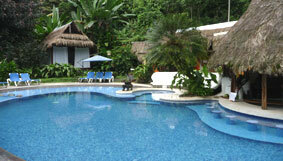 Enjoy the relaxing atmosphere of this small lodge on the southern Caribbean coast. The 14 bungalows are simply styled, and constructed from local natural materials including wood, bamboo and palm, giving a sense of harmony with their surroundings. 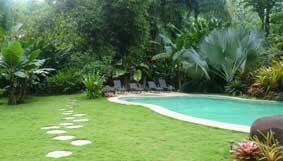 These extend to over 2 hectares and include a swimming pool, and lush native rainforest that attracts birds and monkeys. 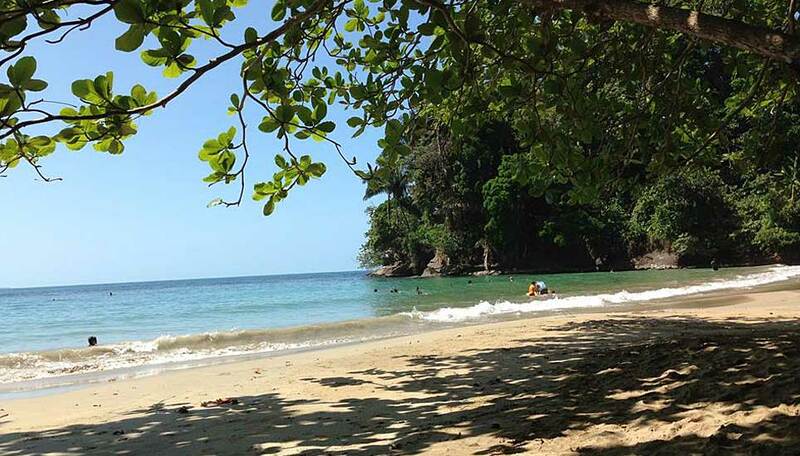 Playa Chiquita is just a short walk away when you crave some lazy beach time. The lounge and restaurant are both set beneath high thatched roofs and open to the sides so are both light and cool. When you want some private downtime retreat to your bungalow terrace and laze on the hammock in total relaxation. With lovely views of Potrero Beach and the Pacific Ocean this hotel makes a perfect coastal retreat. All rooms are suites are well equipped, featuring air conditioning and fans, flatscreen TV, phone, Wi-Fi, minibar, hot drinks maker, iPod dock, safe, bathrooms and private terrace. Suites are more spacious still and have living rooms. Enjoy meals to the sound of the sea in the open air restaurant and relax in the lounge-bar. At the Nau Spa you can submit to therapeutic and pampering treatments, and the hotel has regular yoga classes in a pavilion by the beach free for guests to join. There is a lovely outdoor pool and sunbathing area, and the beach is just a few steps away, and at the end of the afternoon this s great place to watch the sunset. 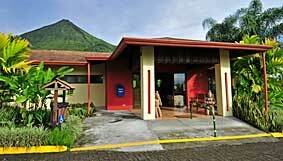 This friendly hotel is located on a farm in the foothills of the famous Arenal volcano. As you would expect the views are spectacular, but they have gone one step further, each wooden cabin has two decks, one facing the volcano and the other with a view of the tropical rainforest. You can choose your view depending on your mood, what more could you ask for? The cabins are dotted about the beautiful landscaped gardens. From here you can access the private trails into the primary forest and explore at your leisure. Take a refreshing afternoon dip in the pool or relax in the Jacuzzi and then on to dinner in the hotel restaurant which serves up delicious meals, both local and international in style, to suit all tastes. For adventure lovers and nature lovers alike, Hacienda Guachipelín is the perfect port of call in Rincón de la Vieja. This is cowboy country and the accommodation is on a working cattle farm, you can see the Sabaneros (cowboys) go about their daily work here. You can even try out the horses yourself and head out on a guided trek to explore the area, very different to other parts of Costa Rica. Dry parched savanna dotted with hot springs, boiling mud ponds and turquoise waterfalls. From your comfortable ranch-style room, you can enjoy views of the volcano and the Hacienda. Relax on your veranda and listen to the sounds of nature all around. 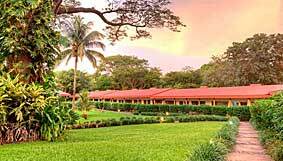 The hotel is down-to-earth, comfortable and a great place to experience real Costa Rica. This lodge has a stunning setting high above 2 river canyons. Its owners have created a stylish, contemporary property and a range of hiking trails, mountain bike routes and an amazing canyon adventure which incorporates swings, ladders and hanging bridges. Between activities you can relax with massage or volcanic mud body wrap, swim in the pool, sip cocktails in the bar and savour healthy, flavourful food, dine by candlelight on a platform almost 50 metres above the Perdido and Blanco rivers. Guest bungalows, all en-suite, have all the creature comforts you could wish for including flatscreen TV, IDD phone, coffee maker, minibar and music system.